1. How long is my rental period? Your rental period is for an 8-hour period of time, to include move-in and move-out. The normal contractual hours of occupancy is 8 hours scheduled between 8:00am and midnight. Arrangements can be made beyond these hours and must be made with the Sales Manager and may be subject to overtime charges. 2. What is included with our rental? We include the setup of our tables and chairs, standard white linen tablecloths, a podium and microphone. 3. Do you include set-up and break-down? Our staff will work with you to finalize a floorplan diagram for your event. Event areas will be cleaned prior to each event at no charge. We include the set-up of tables and chairs owned by the Havelock Tourist & Event Center at no charge. Any rental items brought in to the facility will be the responsibility of the client. 4. When can we move-in and move-out? If your decorating or move-in needs exceed the standard 8-hour rental block, we offer a half-price fee for move-in/move-out of the full-price room rental fee. Reduction in price is due to maintaining minimum comfort and staffing levels. If you require temperatures or staffing beyond minimum levels, 100% of the rental rate will apply. 5. Where can we load and unload our belongings? We allow loading and unloading through our loading dock or doors at the rear of the main hall. Temporary parking is allowed in the rear of the main hall for unloading/loading purposes only and must not block service lane or fire lane. Vehicles must be moved to a designated parking spot following unloading. 6. What decorations are allowed? We allow a wide range of decorations, but please get prior approval of any decorations or signage from the Sales Manager prior to your event. Please do not attach anything to the walls or doors without prior approval of the Sales Manager. We allow the use of painters tape to adhere signage to the walls, but any damages to walls or other surfaces will be billed to the event. Notify the Sales Manager of any banners that need to be suspended. 7. Can we have balloons? Yes, we do allow balloons. Due to the height of our ceilings, helium-filled balloons and similar objects must be secured. Lessee will be billed the cost to recover escaped balloons, including rental fees for a lift. If you plan on using balloons at your function, we reserve the right to charge a deposit fee to cover the cost of balloons that escape. 8. Do you have decorations and linens we can rent? Yes, we have a selection or rental items, including mirror tiles, vases, hurricanes, candle holders, etc. In addition, we have a limited selection of colored linen napkins and overlays. Please ask our sales staff for more information about our selections. 9. What size are your tables? We have 6′ banquet tables and 60″ round tables. Standard white linens included are a 90″ round tablecloth and a 52″ x 114″ tablecloth on rectangular tables. 10. Can we provide our own catering? No, we cannot allow any food or beverages to be brought into the Center. All food and/or beverages served, offered and/or sold in any part of the Center’s premises must be provided and served by a caterer who has met the requirements and entered into a signed catering agreement with the Havelock Tourist & Event Center. We can provide you with a list of authorized caterers for your convenience. We also have in-house services including catering and concession services. We are happy to help you coordinate your catering needs. 11. Do you have audio/visual capabilities? 12. Can we hire our own DJ or florist? We do not have an approved vendor list for anything other than catering. You may choose any florist, DJ, event coordinator, or photographer that you like. We can supply you with a listing of local vendors, but there are many to choose from in the area. 13. Do you have staging available? Yes, we have rental staging. We have up to 10, 4ft by 8ft sections of stage. When rented, our staff will set-up the stage for you, according to your specifications. 14. Do you require a dance floor? We do not require you to utilize or rent a dance floor for your event. The Center has tiled floors so it is not necessary. It is up to the preference of the client. 15. Can we have alcohol at our event? Yes, we have all NC ABC permits (Alcoholic Beverage Commission) as a Convention Center. No alcoholic beverages can be brought into the facility. All alcoholic beverages for events will be provided by and served by the Tourist & Event Center with the exception fundraising events of non-profit organizations. We can serve beer, wine, and mixed beverages (liquor). We require that you utilize our bartending staff. There is an additional fee for this service. 16. Do you offer a non-profit rate? Yes, we have a reduced rental rate for non-profit organizations. Havelock non-profit organizations whose primary local offices are physically sited within the city limits of Havelock qualify for reduced price events in accordance with the above fee schedule. To qualify, the organization must provide documentation confirming their non-profit status (ie. a copy of their IRS designation as a non-profit entity). 17. Are there local hotel accommodations? 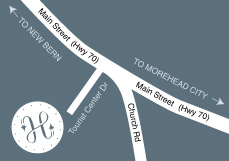 Yes, there are many local hotels and motels in Havelock, two are within walking distance of the Center. Our staff will be happy to provide you with more information for your overnight guests. info or to reserve your space! Copyright © 2017 All rights reserved. Web site design by Trade Ideas.